Also new to House of Jerky is this Black Pepper Alligator Jerky. See our reviews of other varieties from House of Jerky. House of Jerky has become one of the hottest gourmet brands of jerky thanks to a growing number of its own branded jerky stores throughout the United States. House of Jerky uses all natural ingredients and no preservatives. This Alligator Jerky is made from 100% alligator meat. According to House of Jerky's description, this jerky is "hand made", with a "mild flavor". Next in the on-going series of The Jerky Connection is this Devil's Den variety. See our reviews of other flavors from The Jerky Connection. Run by Tom Greineder, The Jerky Connection is a new business that launched in June 2012, based out of Wrightsville, PA, boasting several flavors ranging from mild to insanely hot, including a line of jerky dubbed, "7 Gates of Hell". This Devil's Den is described by the company as being the ultimate destination after you've passed through all 7 Gates of Hell. Having won the Silver Medal in the 2013 Scovie Awards, it's supposed to be even hotter, being made from a, "...sinister blend of peppers". Rounding out the series on Crazy Cow Jerky is this Cowafornia Beef Jerky. See our previous reviews of Crazy Cow Jerky. Crazy Cow Jerky is a brand of MadCow Beef Jerky Co., based out of Carmichael, CA. The company, started by Lon McPherson in 2007, has grown throughout Northern California filling store shelves in several high profile outlets including Raleys, Bel Air, Nugget Markets, and others. This Cowafornia Beef Jerky is described by the company as being "...the most unique original flavor out there. Sweet, a bit tangy, and watch out for that celery seed!" Moving along in the series on The Jerky Connection is this Cracked Black Pepper variety. See reviews of other flavors from The Jerky Connection. Run by Tom Greineder, The Jerky Connection is a new business that launched last June, based out of Wrightsville, PA, boasting several flavors ranging from mild to insanely hot, including a line of jerky dubbed, "7 Gates of Hell". The company describes this Cracked Black Pepper jerky as being, "...doused with tons of freshly cracked black pepper and marinaded to perfection", and made with, "high quality peppercorns". Pa Pa's Jerky is a brand of Abner Snack Foods, Inc. based out of Bell City, MO. The company launched in the Summer of 2010. It got started in 1997 by "Papa Abner" who received a dehydrator as a gift around the time he retired from work. After perfecting his recipe, and later on getting a smoker, word got out around the tiny town of Bell City (population 400), and folks started showing up at Papa's place to eat jerky. Eventually his sons turned the hobby into a business, opening up an off-site facility and getting state inspection. As of this writing, Abner Snack Foods is working on federal inspection. Moving along in the series on Crazy Cow Jerky is this Peppered Beef Jerky. See our previous reviews of Crazy Cow Jerky. This Peppered Beef Jerky is described by the company as being "not for the pepper shy", and that their jerky, "...has a kick without the sweat." Real Turkey Jerky is a brand of Real Steak Jerky is a brand of RSJ Ventures, LLC based out of Naples, FL. It was launched in 2009 by a couple of golf buddies, Dennis Riedel and Blair Swiler. It's the same company that makes Real Steak Jerky, which I reviewed earlier. This turkey jerky is their newest product, made from 100% turkey breast. They claim it to be fat free and gluten free. Real Turkey Jerky and Real Steak Jerky is available in golf pro shops across the United States, as well as many half-way houses, grill rooms, and from their website. New to House of Jerky is this Black Pepper Kangaroo Jerky. See our reviews of other varieties from House of Jerky. This Kangaroo Jerky is made from 100% kangaroo meat. According to House of Jerky's description, "it's not gamey, has a nice texture with a tinge of sweetness". Next in the series on The Jerky Connection is this Peppered Garlic beef jerky. See our other reviews on The Jerky Connection. This Peppered Garlic is described as, "like eating your favorite cut of garlic and cracked pepper crusted steak. Marinated to perfection and made to please beef jerky lovers that also love pepper and garlic!" Kings County Jerky Co. announces an exciting new deal for jerky lovers! The first fifty subscribers to this limited offer will earn a one year jerky subscription at 50% off! That's a pound-a-month of award-winning, grass-fed jerky shipped FREE at half the regular price! BestBeefJerky.org, The New York Times, Men's Journal and The Daily all agree that Kings County jerky is a cut above the rest. Handcrafted from 100% grass-fed beef and all natural spices, this is real jerky made from real ingredients. No feedlot beef, no corn syrup, no MSG, no nitrates, no artificial additives of any kind – just grass-fed steak and freshly toasted spices. The $399 VIP membership offer gets subscribers free delivery of over $800 of grass-fed jerky for one year. That's a pound-a-month at less than $34, plus more than $100 in saved shipping costs. Subscribers can choose from Classic, Korean BBQ, Sichuan Ginger, or a custom mix of flavors. The first delivery ships on January 28, and includes a free Kings County market bag. VIP members also receive free preview samples of new products throughout the year. For the true jerky connoisseur, it's an offer not be missed. 1 Pound a Month for a Year! With only fifty VIP memberships available for 2013, this deal won't be available for long. For details, visit www.kingscountyjerky.com. Next in the series on The Jerky Connection is this Lizard Wizard. See our reviews of their other flavors. Described as "the right amount of sweetness with a little zip", this Lizard Wizard flavor is made with a sweet and tangy marinade with a "secret blend" of crushed peppers. Note: Pap's Foods is a sponsor of this website, but has no effect on our ratings and reviews. 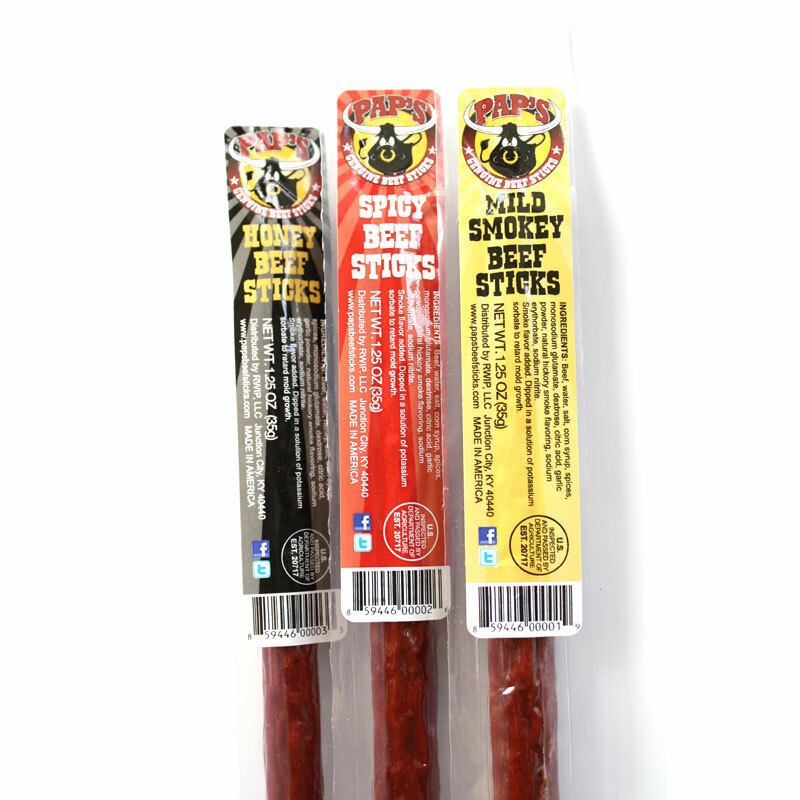 Pap's Genuine Beef Sticks is a new brand of meat snacks based out of Junction City, KY. It was started by Rick Waldon. Waldon's philosophy with beef sticks was to make them out of beef, and not "mechanically separated chicken". And instead of filling them up with soy and wheat fillers, he actually fills them up with beef. The result is a beef stick made of beef, and American raised beef at that. Moreover, Pap's Genuine Beef Sticks claims to be a "tender, moister, beefier" beef stick. Presently the company offers three flavors, Mild Smokey, Honey, and Spicy, with more flavors are coming this year. They are currently stocked in convenience stores throughout Kentucky, Tennessee, Ohio, and Indiana. You can also buy them from their website. Next up in the series on The Jerky Connection is this Montreal beef jerky. See my reviews of their other flavors here. This Montreal beef jerky, I presume is named such after the famous Montreal steak seasoning. The package states, "You will be convinced you are eating one of the best steaks you ever had." Kratos High Protein Beef Bars is the newest brand of energy snacks just now hitting the market. Kratos is a brand owned by QuarterShare, LLC, based in Tulsa, OK, whose beef sticks we reviewed earlier last month. Named for the mythical Greek God of strength and power, Kratos is made from 100% Midwest lean beef, contains 11gm of protein per bar, zero sugar, no preservatives, and are gluten-free. Kratos comes in three flavors, Acai Berry, Blueberry, and Spicy Pepper. Moving along in the series on Crazy Cow Jerky is this Smokey Teriyaki. See our previous reviews of Crazy Cow Jerky. This Smokey Teriyaki is described by the company as "a bold, robust, yet dignified palet teaser", going on to say that, "there's no second hand smoke in this Jerky! We put it in, right from the start!"